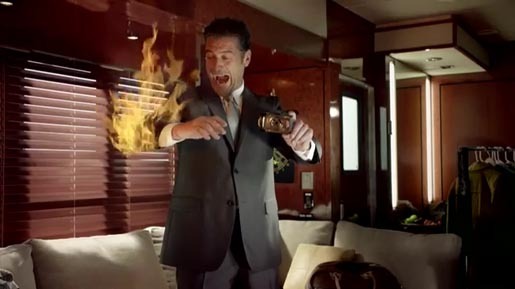 Olympus is running a television advertising campaign in the United States featuring people flipping through their Olympus digital cameras, literally reliving fiery stunts and party fowls before our eyes. The Stunt Man and Office Party ads were developed at SCPF, Miami, and Global Integrated Producer (GIP) by executive creative director Pablo Monzon, executive producer Ursula Bertrand, senior producer Mariana Black, group account director Lisa Paravano, account executive Vanessa Romano. Filming was shot by director Richard Farmer via Green Dot Films, Los Angeles, by executive producers Darren Foldes and Rich Pring, director of photography Crille Forsberg, production designer Sean Hargreaves, producer Matt Caltabiano. Additional production support was provided at In&Out productions, Miami by executive producer Frida Sellar. Editor was Noah Herzog at General Editorial with producer Robert Parker. Visual effects were produced at Ring of Fire, Los Angeles, with executive producer John Myers, creative director/VFX supervisor Jerry Spivack, VFX producer Casey Conroy, assistant VFX producer Tammie Smalls, Flame artist Brian Shneider, graphics team Stephen Grimm, Tony LaTorre. Color correction was done at Cinelicious by colorist Steve Rodriguez. Audio post production was done at Uptempo Music & Audio Post, Miami, by executive producer Roger Dominguez.